Celebrating the constantly changing nature of our human experience. Every hillside and front lawn for miles around the Bristol Motor Speedway is host to campers of every size and shape filled with all-American auto race fans. They are a casual bunch for the most part, sporting bright coolers filled with Busch and Pepsi, and tee shirts picturing the racer they favor. Mobile vendors provide a race parafinalia tent city just across the street from the speedway. There one can purchase clothes, mugs, bath mats, glasses, lighters, food, drinks, race car models, bath towels, key chains, posters, and much more usually inhanced with the name, photo, autograph, or race car number of your favorite racer embossed somewhere on the product. We think the best spot to watch this race is in our own TV room at home, But Liza volunteered to drop of and pick up some family race attendees this year when she captured the photos above. All this excitements got the best of us so we watched most of last night’s race and plan to watch the big race tonight on ESPN2. I was personally amazed by the youth of some of the drivers and their amazing crews. Seasoned drivers were represented as well and all seemed positive and up beat about their sport. No bad boy behavior, drug testing scandals, or mean comments about their competitors. That part was refreshing. The raceway chatter was about the new surface to the track which most of the drivers approved. 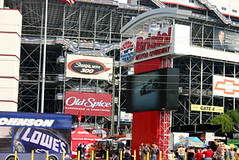 Hope you enjoyed our hometown veiw of Nascar in Bristol. Warm wishes and happy racing! Posted by Vote Mia 2018! Since 160,000 folks have come to town to watch car racing this week, we are taking a few days off from the renovating of our project house to take in the festival feeling of one of the biggest car racing events in the world. Now, I am technically a native but really not much of a “gear head”, as car racing fans are referred to. But it is hard to deny that when all these auto racing fans come to town it is quite an event! 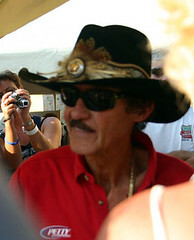 Pictured here is Richard Petty, one of Nascar’s racing legends. Liza got this photo during “Food City Family Fun Race Night”, a fan appreciation event held on Thurs. night before the week-end races. One of the racing teams had a mock pit where ordinary people could try changing a tire to a timed challenge. Changing a tire is apparently not as easy as those guys make it look in the pits on race day! TODAY: the Sharpie 500!!! Starting Over without my father began a year ago yesterday. Liza’s Starting Over without her mom will be two months tomorrow. Just before we left Tennessee, Liza captured this image. It is impossible to know what is just around the bend. 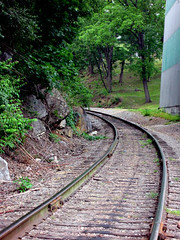 There were times during my grief that I no longer cared what was around the bend for me. In fact, it frightened me because I knew it could be more loss and pain. As I try now with some perspective to make some sense of it all, I have begun to understand that it is only the fearless moving ahead, the bold task of acceptance that will heal us. People say, “Time heals”. It is true. Not because you forget the person, learn to do without them, or will ever forget the gut wrenching pain of their leaving. It is because, with time, I have accepted the fact they are gone. And there is nothing to be done about it. Nothing I can do. So I put one foot in front of the other, understanding that only the Universe can control what is just around the bend. I can only decide to expect happiness again, to prepare for joy instead of fearing the out-of-my-control. So today I will prepare for joy. And soon, with a passion for living and with childlike anticipation, I will again be able to embrace whatever is meant for me just around the bend. We are rehabbers. My Dad taught us about real estate and helped me buy my first property… a triplex at auction purchased for $13,000. We rehabbed it, rented it, my mom help manage it and we later sold it for $30,000. Liza’s favorite rehab was an old victorian in a somewhat questionable neighborhood that was our residence for 18 months. That turn-of-the-century, friendly spirit inhabited, cottage netted us enough profit to make our big relocation to Key West where even in the late 80’s it was difficult to find any kind of little cottage in the historic district for less than $100,000. But after 2 years of looking, we found one and purchased it for $95,000. Three thousand of our own money and a second of $17,000 held by the desparate sellers. Within two years we were able to refinance at better rates and pay off the seller. Fifteen years later we sold this property for over 6 times what we paid for it. Dad, you were right. The harder you work the luckier you get! Because property had gotten so expensive in Key West, we went on the week-ends to Ft. Lauderdale (where we have dear friends) and purchased another triplex, fixed it up, rented it, and sold it less than 2 years later for a significant profit. I love real estate. Now we are back to my hometown. For several years we have been watching our downtown area deteriorate as the mall, strip shopping centers and the suburbs developed. But as many small towns across America, our little town’s city center is enjoying somewhat of a renaissance. The wonderful old historic buildings are catching the eye of young investors, the train station is being renovated, local musicians play in open air gathering spots and new shops are opening. When we decided to come back to East Tennessee (at least part-time), we decided we wanted to be a part of the refurbishing of our downtown. So we purchased the commercial building pictured above. It was built in 1905. Local historians report that it was first utilized as doctors offices. In the fifties, a group of attorney’s occupied the upper floor while various retail businesses occupied the two small storefronts downstairs. When we first saw the upstairs with the huge skylights, and a room with 60 bookshelves built-in (law library) we knew we had found a new project and home. In the eighties, the upstairs was rented by a local radio station. Evidence of this still exists as one bedroom door is labled “studio A, Control room”. We purchased this building last year and have renovated the building with new heating/cooling systems, new wiring, new wood floors, new paint, and new plumbing. We made “studio B, Production” into a roomy and modern kitchen. We like our downtown loft even with the 25 step walk-up and the parking challenges. We miss a yard and a garage, but are proud of our work and our contribution to preserving something historic and worthy. With the interior almost complete we are now working on the exterior… well, actually, Dave the painter guy is. 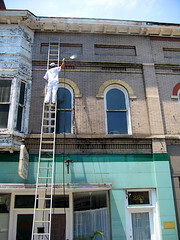 In Liza’s photo above, Dave is pressure washing in preparation for paint. 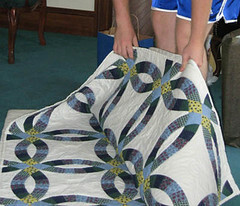 Love the idea of taking something old or somewhat forgotten and giving it new life cycle. Our building will be starting over. Starting over as our new home in the city. 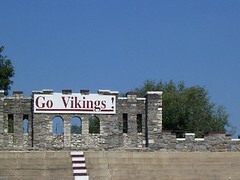 The Stone Castle has played host to the Tennessee High Vikings for over 70 years. With some of my own dear granddad’s labor, the atheletes there still, today, have a terrific stadium, a one-of-a-kind historic sports palace known as the Stone Castle. 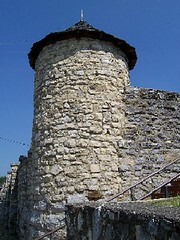 Constructed by the Works Progress Administration (WPA) during the New Deal, the Stone Castle is currently still in use. This stadium is a reminder of the post-World War II era, another time when high school football received top billing around the state. Situated on the campus of Tennessee High School in Bristol, the Stone Castle Stadium opened on October 8, 1936. First known as the Bristol Municipal Stadium, the Stone Castle is constructed of coarse rubble limestone from another WPA project at nearby Beaver Creek, the stadium seats approximately 6,000 and features most of the original Medieval Gothic details. Its unique corner towers, arched entries, and crenellated walls clearly make the Stone Castle the most architecturally significant stadium in Tennessee. Seeing the Stone Castle again makes me remember my own years of high school and MY senior year. Our football team was state champ that year, I ironed my hair to make it straight and my favorite music was soul plus Neil and Eric, Bette and Elton. (Still is.) It was an exciting time. My grandad help build it, my brother was a starting football player within it’s stone walls, and now my keeper nephew just graduated. MVP. Soccer. Honor Society. Good Person. Only nephew, class 2007, is product of his own hard work plus effective and loving parents, caring grandparents, hardworking great grands, and so far back that records are scarce being near the beginning of our very country. So many generations choosing these very hills and valleys for their home. So much of which to be proud. Like being hugged by your roots. And now only nephew will be starting over. Starting over as a graduate from a castle in Tennessee where the spirits of generations before him will forever be his support. PS. Nephew’s graduation presents included (among others) the newest Blackberry and a hand made quilt from his grandmother (my mom). Appropriate mixture of the old and the new technology! Warm wishes until next post! Around the turn of the century, Landon Clayton King was raising championship birddogs. Seeing a need for tough and durable work clothing, in 1913, he founded The L. C. King Manufacturing Company. L. C. King believed that if he could raise championship birddogs, he could produce overalls and jeans of the same distinction. 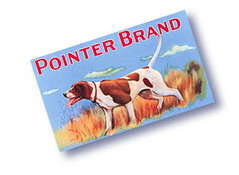 Carrying on the family tradition four generations later, Pointer Brand is recognized worldwide. The L. C. King Manufacturing Company is proud to make everything in the U.S.A. Having survived two floods and a fire, it still operates out of the original location in East Tennessee. 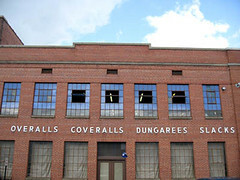 The employees make bib overalls, coveralls, carpenter jeans, hunting apparel and denim chore coats. Several employees have retired after 50 years of service. This explains their birddog logo… but there is more to the story. The first picture in this post is of my GREAT GRANDPA, Papa Smithson (1879 to 1958), taken somewhere in the 40’s or 50’s, wearing Mr. King’s Pointer Brand jeans! My own sweet granddaddy (a proud farmer and lumberman) wore Pointer Brand overalls everyday of his life as I recall (except for a few hours on Sunday, or the occasional wedding or funeral). And now Liza has re-discovered this American treasure and will only wear Pointer Brand jeans. Thanks Liza for reminding us to look for, and appreciate, the USA-made jeans being produced by hard working Americans right in our own backyard. Hi everyone! Welcome to my first exposure to blogging. 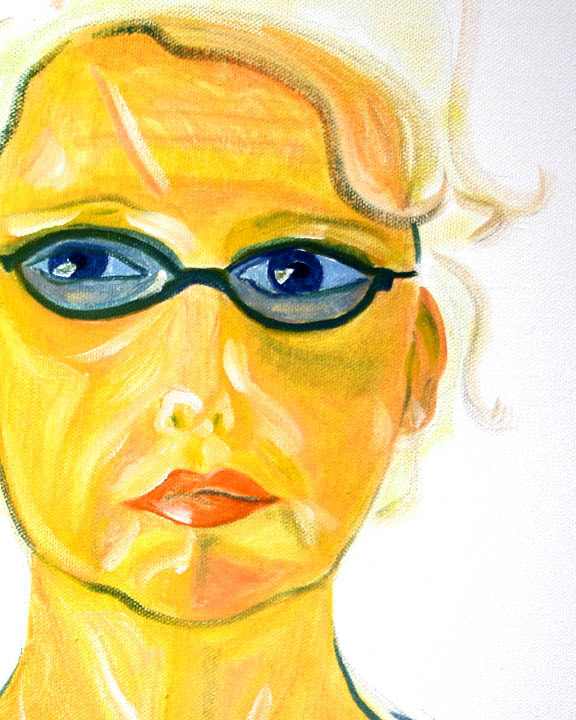 If we define ourselves in terms of how we spend our time, I have been: a college student, a department store buyer, a music store owner, a real estate investor, rehabber and Realtor, and now a want-to-be artist and writer. If we describe ouselves in terms of where we have lived, for me that would be the amazing blue hills of East Tennessee or the tropical sanctuary of Key West. I lost count with over a dozen residence changes since college days. No matter how we define ourselves, whether by address or occupation, it is certain that life is not static and change happens. Whether we change jobs, move to a new home, suffer some great loss like the death of a family member or friend, retire, start anything new or give up a bad habit, we have all had the feeling of starting from the beginning. For me just now, a new life cycle began with the death of my father. We were close and the past seven months since his passing have been some of the most difficult days of my life. I can’t help thinking in terms of B.D.D. or A.D.D., which is before Dad’s death or after Dad’s death. I was a different person B.D.D. A person that had never experienced the gut wrenching pain of loss. I know for me it represents one of those starting over moments. Starting over without Dad. B.D.D. I could call on my father’s wisdom anytime I wanted, A.D.D. I can only guess how he would advise me. B.D.D. I thought he would be around forever, A.D.D. I know none of us will be. It’s a hard pill to swallow. And now as a card carrying blogger, I wonder about the starting over experiences of others. Let me know about your starting over experiences. Hope to update often. Thanks for visiting and warm wishes to all. Please comment by clicking on highlighted “comment” at end of each blog. Thanks for visiting with me. You are currently browsing the archives for the East Tennessee category. ybonesy on A Perfect Schedule. love2sellhouses on Wallpaper Removal Tools!